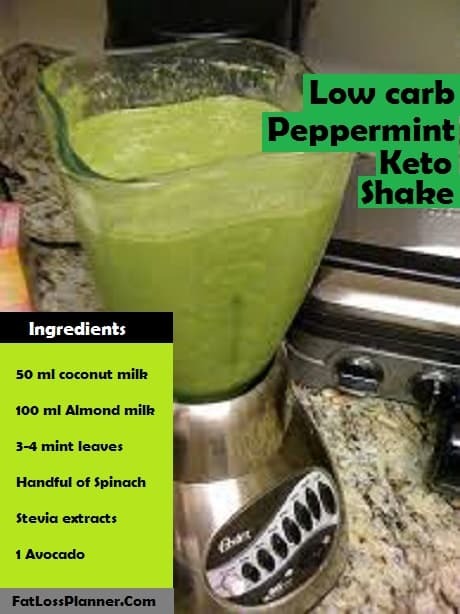 High protein low carb Keto Shakes can make an excellent replacement for your high calorie conventional diet. The best part with this diet is, it helps you keep full and feel full for longer duration, just like your normal diet would. 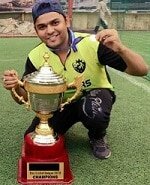 The only trick here is that Keto diet helps you to lose weight faster and provide truckloads of other health benefits. Before we deep dive into the extensive list of Keto shakes. Let’s first understand what a Keto diet is. “Keto diet refers to the process of starving your body of carbs and forcing it to use fat as a source of energy”. During this diet the ketones level in your blood and urine rises exponentially. This process in other words is also known as Ketosis. Ideally it takes approx… 4-10 days for ketosis to kick in depending on your body type and size. Having said that there are many ways you can out your body in ketosis, either by following your conventional Keto foods or through below mentioned keto Smoothies. Now I would like to put a disclaimer well in advance by saying Keto diet is good but don’t use it for long term. Moreover if you have any kidney related disorder then please consult your doctor first. Keto is little demanding on your kidneys. Here are my list of top keto smoothies that not only helps you to lose weight but also boosts the immune system. Strawberries are awesome to taste and super healthy too. The reason strawberry makes it to my list is because of the amazing taste and low carb value. For each 100 gram strawberry you consume it gives approx. 8g of carbohydrates. Due ti its low carb content it makes an excellent fit for our smoothie. 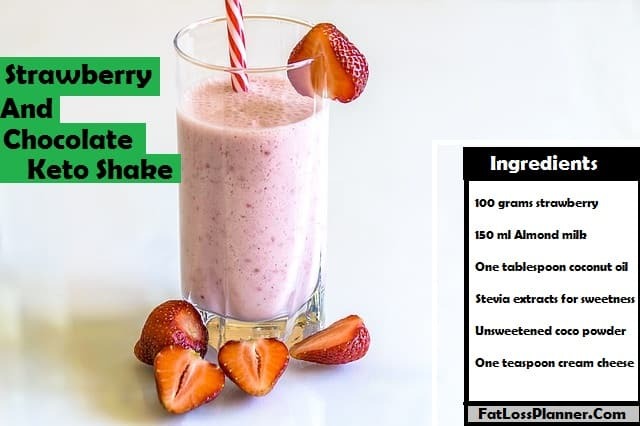 Here are the Ingredients needed to make this high protein low carb strawberry shake. Follow the below steps to make this high protein shake. Step 1: Take 100 grams of strawberry followed by 5 – 6 mint leaves, Table spoon of cheese. Your keto shake is ready. Avocadoes can be extremely creamy. This fruit is loaded with essential fatty acids and vitamins and makes an excellent fit in your keto diet plan. To make Creamy Avocado low carb keto shake follow these 3 simple steps. And there you go, you have a typical low carb keto shake ready. We all keep hearing how beneficial peanut butter is and traditionally its consumed by spreading it on brown bread. Did you know you can also make an excellent smoothie that not only helps you lose weight but gives you much stronger bones? Once you have the above ingredients ready, follow these 3 simple steps to make your low carb shake for weight loss. Step 3: Drink this high protein shake for breakfast or replacing high calorie meals. Just like other smoothies, it’s super easy to make this low carb shake. Simply follow these 2 easy steps. Step 1: Put all the above ingredients in a blender. Your 100% Low carb Ketogenic shake is ready to be consumed for breakfast or to replace your meals. This recipe is focused on providing high protein and low carb at the same time providing the awesome chocolate taste. 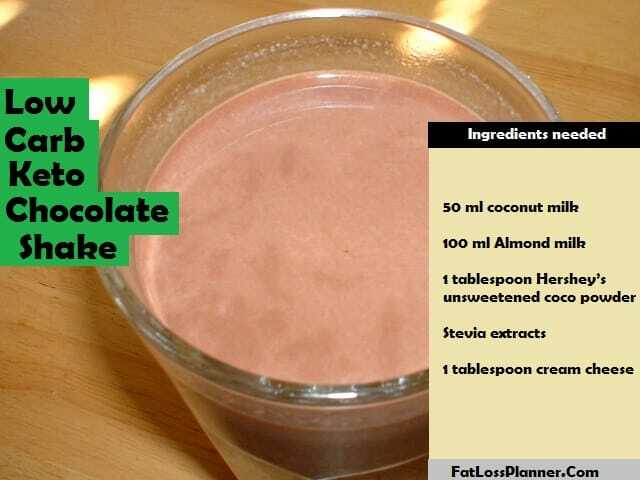 To make this high protein Keto Chocolate Smoothie follow 3 simple steps. Step 1: Mix all the above ingredients in a bowl. If you are unable to control the calorie intake, then this may just be a wise option. Ideal meal replacement shakes are those that give you all the nutritional value that your body needs by keeping the carb content in check. To make this meal replacement weight loss shake let us look at the ingredients needed. To make this Low Carb, High Fat and high Protein keto shake follow these two simple steps. Have this keto smoothie or Keto protein shake for your breakfast or Lunch. Note: This already has a high calorie value, so avoid unnecessary eating when doing this as unnecessary eating will ruin the whole process. All these we have been studying and hearing that Keto diet is always high fat and low carb. While that’s true did you know you can also take the advantage of antioxidants loaded green veggies when on keto weight loss diet? Well let me show you how you can make green smoothie for weight loss and wellbeing. To make your high protein green smoothie follow these 3 simple steps. Your low carb green keto smoothie is ready. You can consume this either for morning breakfast or for lunch to replace the meal. Who doesn’t like chocolate? What if I said you can lose weight even if you consume chocolates? 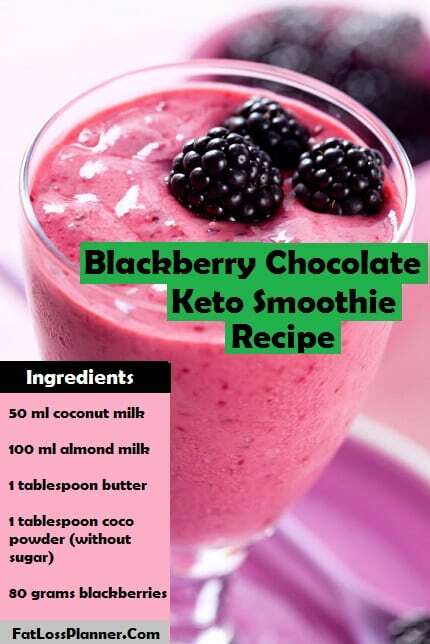 Well I know it sounds exciting, but to be honest there is a concrete way to make your chocolate keto smoothie that will help you lose weight quickly. 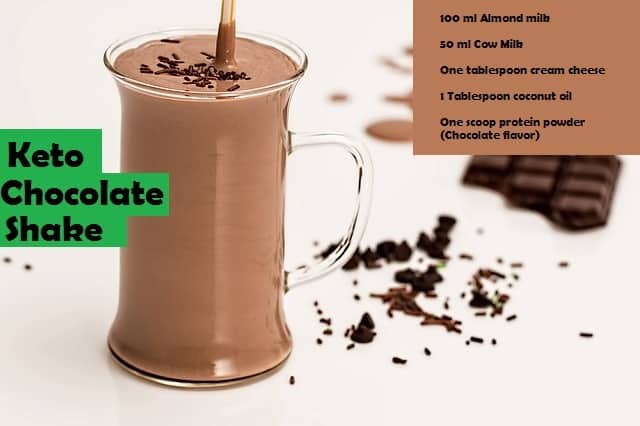 To make this weight loss keto drink we are not using any chocolates, instead we will use coco powder. 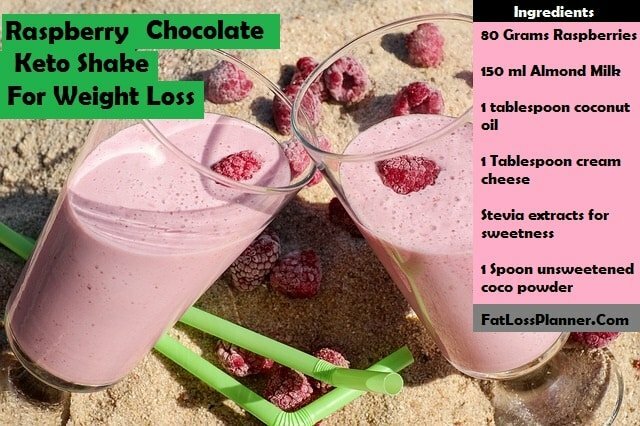 Let me show you how you can make your tasty chocolate drink for weight loss. To make your weight loss smoothie, follow 2 simple steps. Step 1: Take a blender and put all the above ingredients in it. Have this Keto shake for breakfast. 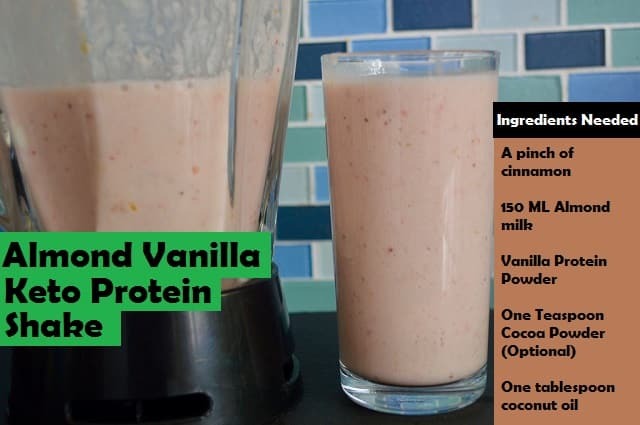 Once you have the above ingredients ready, making this high protein smoothie is straight forward. Follow 3 simple steps to make this low carb keto shake. Step 1: Take a blender, put all the above ingredients in it. 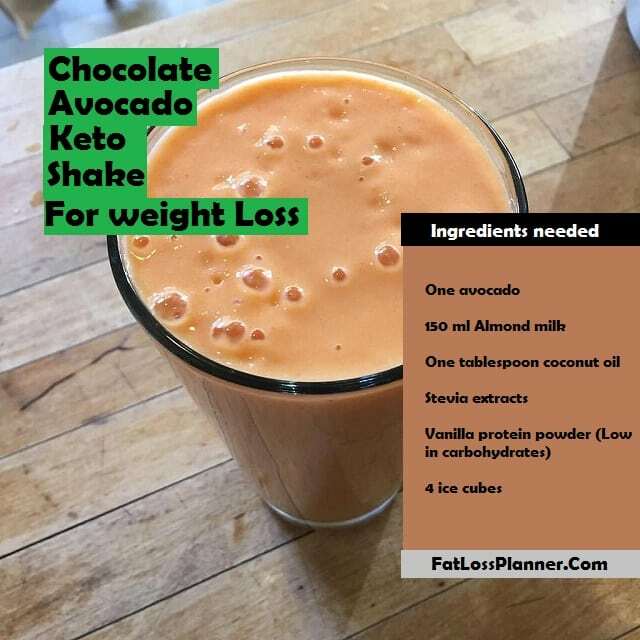 Your keto chocolate avocado smoothie is ready, this keto shake is loaded with high quality fat and protein. Raspberries are low on carbs, thus it’s an excellent fit for your weight loss diet. 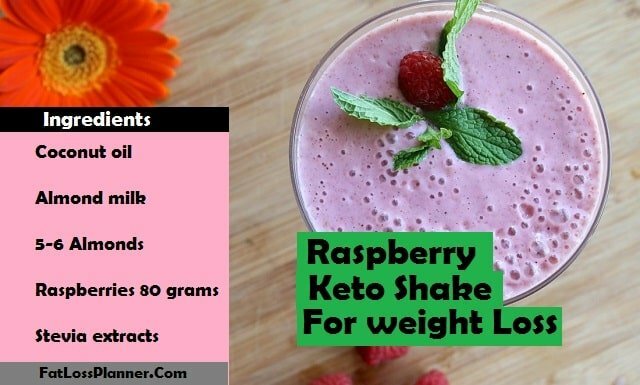 A single serving of 100 grams of raspberry gives approx. 12g of carbs. To make raspberry smoothie you would need below ingredients. That’s all that you would need to make this high protein keto smoothie. Have a glass of this drink for breakfast or lunch. 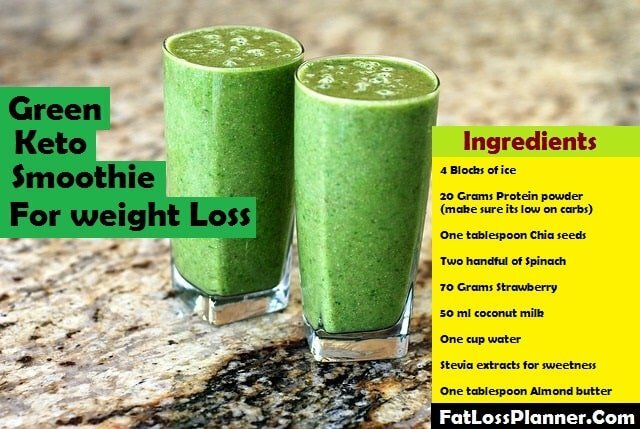 This is again a green smoothie targeted for weight loss. If you are on a keto diet then you can fit little bit of greens as well. This will help you to boost the metabolism and detoxify the liver. Follow 2 simple steps to make this quick low carb high protein Keto smoothie. Step 2: Add some stevia extracts to make it tastier. 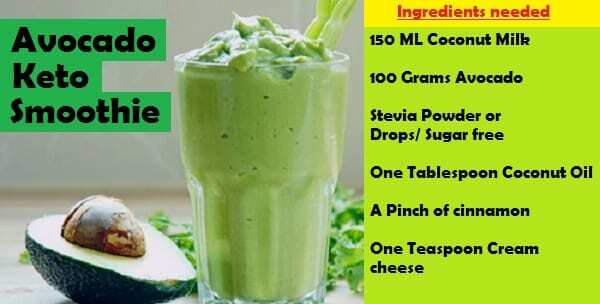 Have this drink for evening snacks or for dinner for best results. Garnish it with strawberry to make it look good. 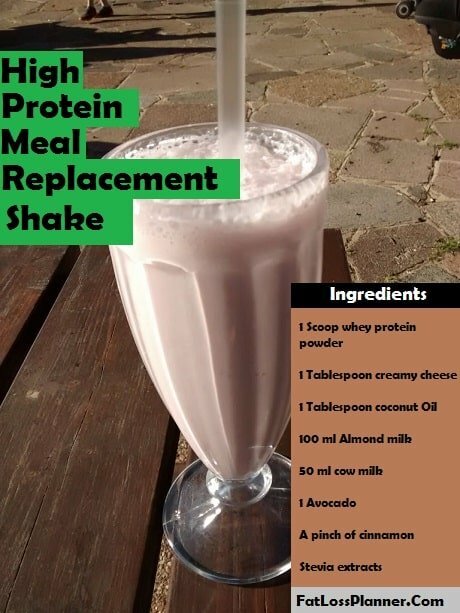 Ingredients needed for this simple high protein shake. Step 1: Wash the peach thoroughly and cut it into pieces. Step 2: Put all the above ingredients including peach in the blender and blend it thoroughly. Step 3: Garnish it with some chopped peaches. 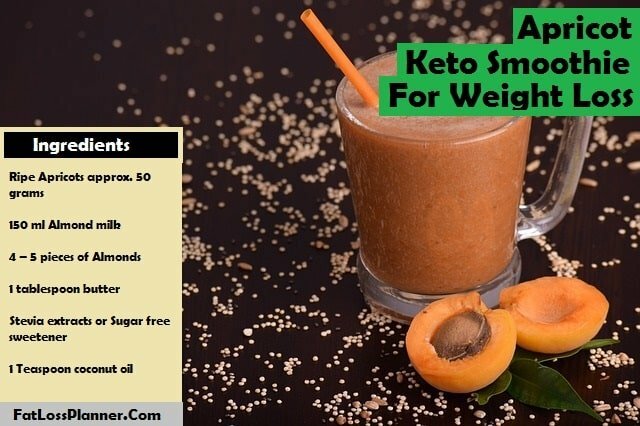 Once you have all the ingredients ready you can make your high protein apricot based Keto shake in 2 easy steps. Step 3: Garnish it with few chopped apricots as per your liking. Let’s take a quick look at the ingredients needed to make this high protein low carb smoothie. To make this high protein shake follow these 3 simple steps. Step 3: Garnish it with few raspberries as per your liking. 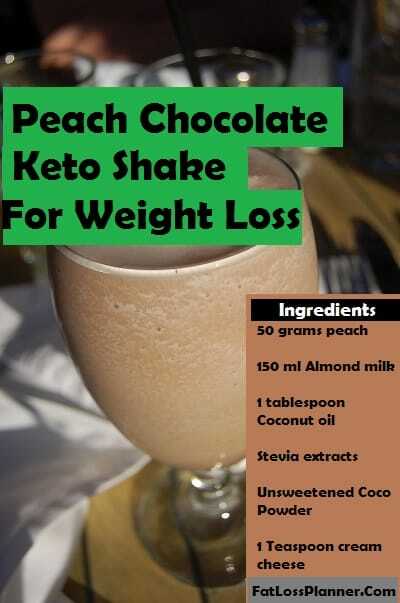 This is similar to peach keto shake above, the only difference is the coco powder. To make this you need similar ingredients i.e. 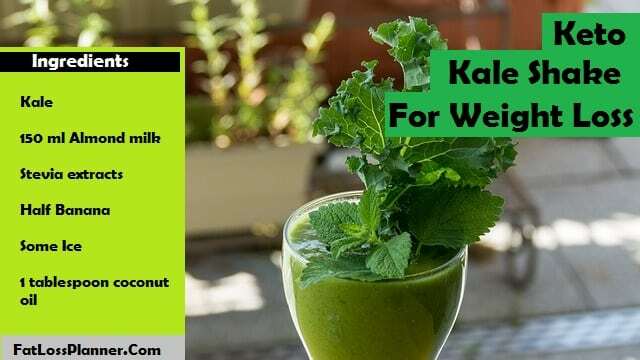 To make this amazing fat burning kale smoothie follow the below steps. Step 3: Garnish it with mint leaves to look delicious. Here is a quick green smoothie that will not only help you lose weight but also benefits your liver, kidneys, heart and sugar levels. Step 3: Garnish it with mint leaves to look good. 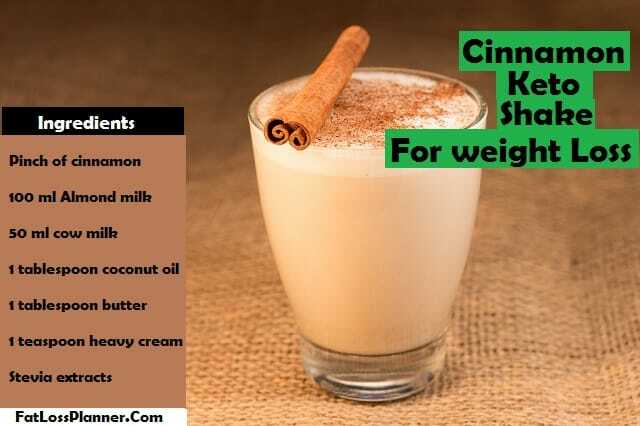 When it comes to weight loss one cannot ignore cinnamon. Go to any dietician and they would say how beneficial cinnamons are. A glass of cinnamon water on an empty stomach can fight diabetes, blood pressure and heart ailments. Having said that you can implement this potent fat burner in your daily diet by way of smoothies and shakes. The recipe below is especially suited for those who are on keto diet. Making this weight loss drink is super easy too, follow two simple steps to get your smoothie ready. Step 3: Serve it by sprinkling some cinnamon powder for garnishing. These berries are low on carbs hence I simply cannot ignore them. 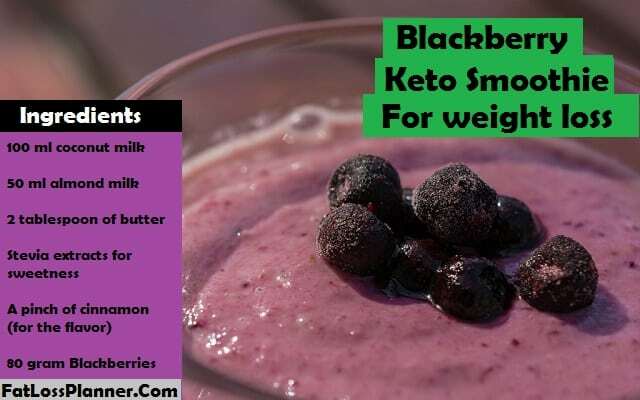 Most of the berries makes an excellent fit for any Keto Shake diet. 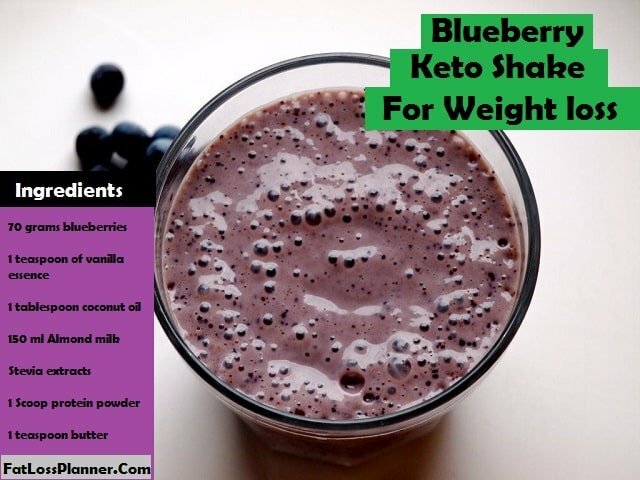 Today I will show you how to make a blueberry keto shake for weight loss. Stevia extracts (only if you want to make it super sweet). Once you have all the ingredients ready, it’s time to make this fart burning smoothie in 3 simple steps. Blackberry combined with chocolate becomes extremely tasty. 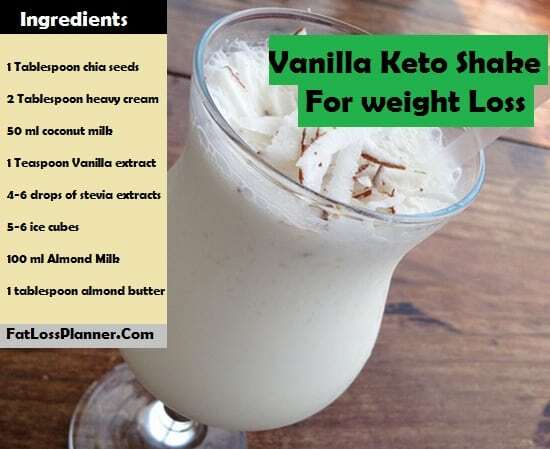 Enjoy this tasty Keto shake for weight loss by pleasing your taste buds. 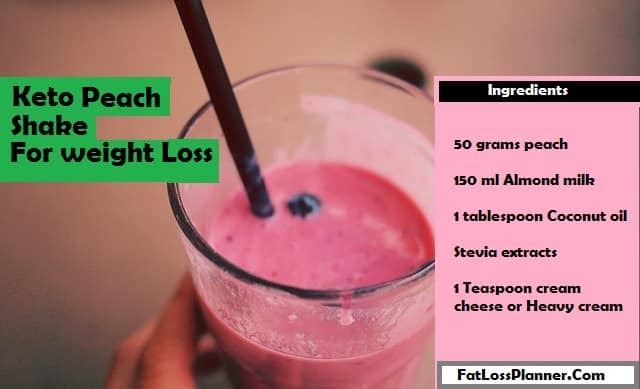 To make this weight loss keto smoothie follow below steps. Step 1: Mix all the above ingredients. Step 3: Garnish it with one or two chopped blackberries as per your linking. It’s simple and straight forward to make this weight loss shake. Serve this by garnishing your weight loss shake by using blackberries. In India turmeric has been used since ancient time for curing multiple ailments. Along with its Anti-inflammatory properties it’s also known to boost the immune system and fight common cough and cold. Apart from all these qualities turmeric helps boost the metabolism and strengthens the liver too. Today I will show you how to make Turmeric and Cinnamon shake for weight loss. 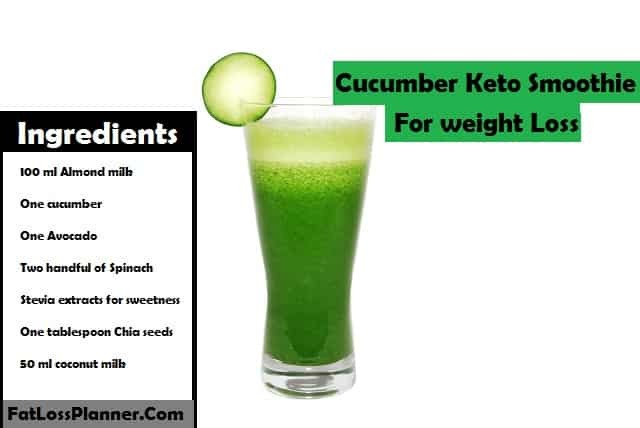 Let’s take a quick look at the ingredients needed to make this keto weight loss shake. If you have all the above ingredients ready in your kitchen you can start making your fat burning in 5 easy steps. Step 5: Garnish it with a pinch of turmeric powder to make it look nice. Who doesn’t like the taste of Vanilla? We are all used to consuming cookies, cakes and pastries made from vanilla extracts. While cookies and cakes can add weight, did you know you can use vanilla extracts to make a weight loss shake? 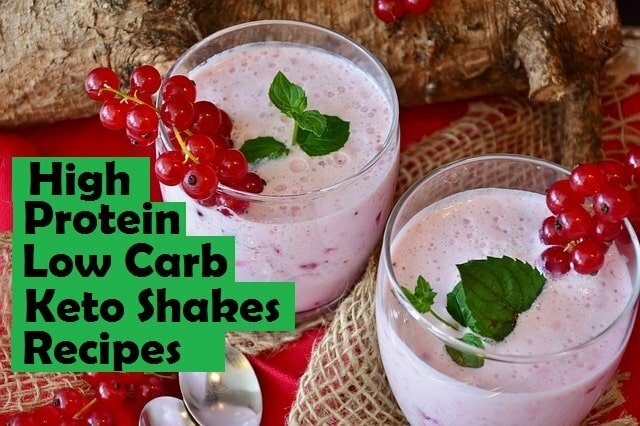 Follow these 4 easy steps to make this low carb weight loss keto shake. Step 4: serve it by garnishing it with chopped almonds to make it look beautiful. Coco and almond combined together gives you the chocolaty and nutty taste. 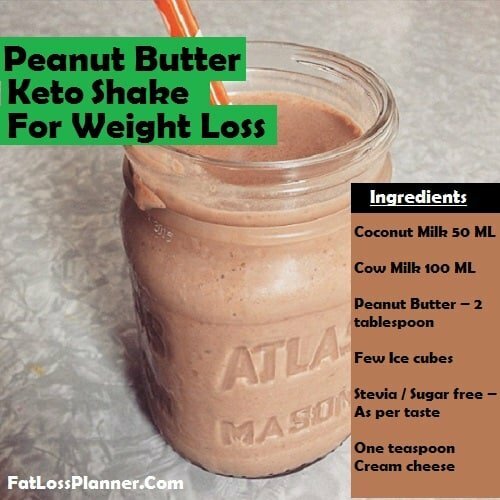 Making this fat burning ketogenic shake is super simple. Simply add all the ingredients in the blender and blend it until you have a nice and even smoothie. You can serve this smoothie by garnishing it by chopped cucumber or avocados. 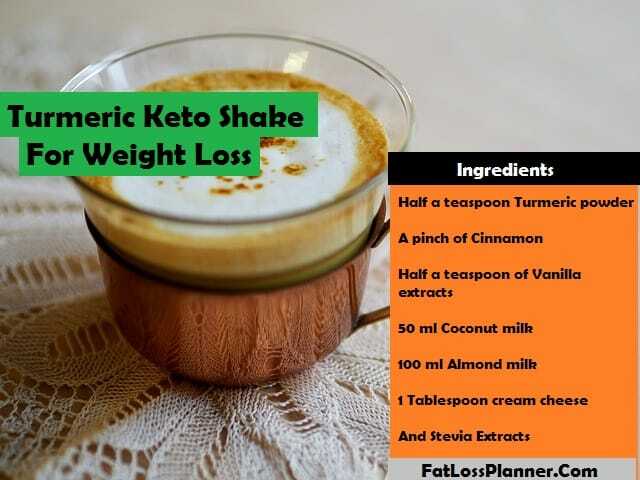 Keto shake diet or Keto smoothie diet is actually well designed to help you lose weight holistically without starving yourself. When on ketosis your body goes into fat burning mode as the carb supply is restricted and metabolism is boosted. This means your body needs the energy source much faster due to ignited metabolism. And guess what if you have restricted the carb intake the only source of energy becomes the fat. So there is a science behind it. Furthermore most of the keto shakes or keto Foods that you eat will make you feel full for long time. Therefore it suppresses the unnecessary hunger pranks. The real trick with this science based approach is restriction of Carbs. Due to low carb properties Keto diet becomes suitable to anyone who wishes to come back in shape. Ketogenic diet can be extremely nutritious and loaded with tons of anti-oxidants. When you consume Almond milk, cucumber, Avocado, Almonds, Coconut milk, Coconut Oil, Chia Seeds and similar ketogenic food, what happens is you automatically consume the antioxidants that comes along with these highly nutritious food. The best part is none of the nutrients are lost. Almost all the nutrients are retained as you are not cooking these food items at high temperatures. When on Ketosis liver is highly active since it ignites the metabolism. Liver starts using fat as the energy source due to low carb supply. Furthermore, if you are suffering from Fatty liver disease then Keto diet may just do the trick for you. This science based diet has already been proven to help you shed pounds, therefore it becomes a smart choice to reverse the non-alcoholic fatty liver disease using proven diet plan. Did you know limiting the carb intake and reduce acnes and pimples? Yes that’s right, various studies done on high carb and low carb diet shows that, lesser the carb intake the more difficult it would get for acne to break out. So switching to low carb diet may be your go to diet if you are suffering from Acne or pimples. Consumption of low carb nutritious keto food helps in digestion and fat assimilation. As majority of keto foods are extremely high on Protein, essential amino acids, Omega 3 and many other important fatty acids, it helps to strengthen the immune system. This does not happen overnight though, it just takes 10 – 15 days to get the results desired from your high protein low carb keto shake diet. Most of the benefits that comes are actually from potent anti-oxidants in these weight loss keto smoothies. Furthermore, keto smoothie diet is extremely vicious for the bad bacteria inside your stomach. It’s known to starve the bad bacteria that are highly dependent on carbohydrates to thrive. 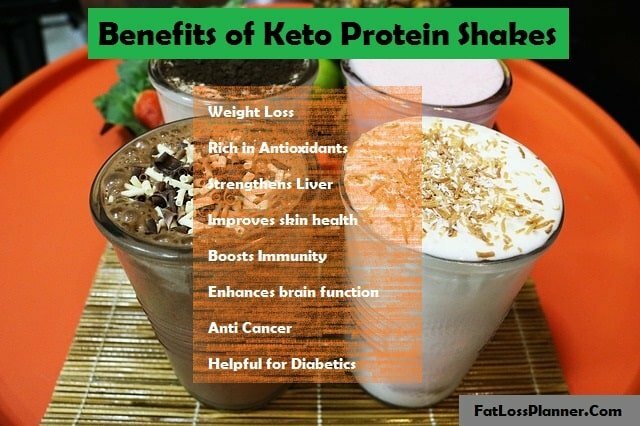 Some of the keto weight loss shakes contain high amounts of essential fatty acids and Omega 3’s. These fatty acids helps to strengthen the nervous system and boost the brain function. Studies also show that Omega 3 fatty acids are excellent for heart and endothelial linings. In India it’s a common practice to consume Almond milk or Almonds especially those who are in schooling. In India it’s believed that “Badam Milk” or “Badam” i.e. Almond helps to boost memory. Most of the keto drinks are extremely high on anti-oxidants. These anti-oxidants fight free radicals and cleanses the internal system holistically. The real secret however is in the nutritional contents of any keto diet. Keto diet are meant to be extremely low on carbs and high on Proteins and anti-oxidants. And we all know cancer cells love high carb diet. When on ketosis you actually starve your body of carbs thereby making it harder for cancer cells to survive. Having said that there is much more you would need to do if you are fighting cancer. Doctors usually recommend not to drink juice for diabetics as it can spike up the sugar levels. But in Keto that is not applicable since this diet is just what every doctor recommends to all diabetics i.e. low carb, no sweets, high protein diet. Guess what keto does just that. 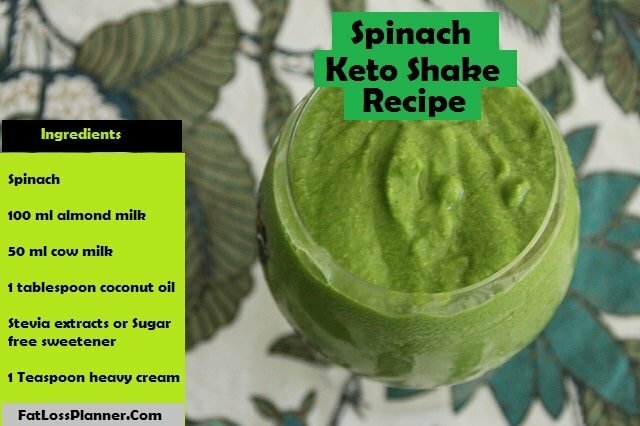 Consumption of Keto smoothies fulfill your daily nutritional needs at the same time keeping away the unnecessary carbs that spike up the sugar levels. 1.) Watch the carb intake, ideal Keto diet should not have more than 22g of carbs in a day (for a healthy individual without any ailments). 2.) Don’t go overboard with Fat, while ketosis needs high fat and low carb diet you shouldn’t consume too much fat as that will choke the arteries. 3.) Walk for at least 30 minutes a day. 4.) Whenever making any shakes always take a close look at the ingredients that you are using and always make a smart choice. What I mean is, if you are making a Strawberry Shake then look at the carb intakes. 100 grams of strawberry produces 8g of Carbs therefore to complete the quota of 22g of carbs a day divide it evenly. 5.) Don’t continue keto diet for prolonged period of time. Once you achieve the desired results, follow a normal diet. Having said that when following a normal diet you need to work out for at least 30 – 60 minutes a day or else your body will again start accumulating carb and convert it into fat. 6.) When on Keto diet avoid sweets and carbs as the cravings will be there during ketosis. No matter what diet you choose ketogenic diet, Juicing diet, Zero Oil diet or any other diet, discipline is the key. To make any keto smoothies if you are using protein powder then make sure you are not using more than one scoop as the intake of carb has to be limited. Moreover if you are following ketogenic plan and at the same time you are consuming high carb foods then the process will back fire. You will observe you are putting on more weight. Therefore when on keto shake diet never give your body the excessive amounts of carbs. Also during this period you will crave for sweets and chocolates at least that is what I have observed. Don’t do this huge mistake of giving your body chocolates or sweets. Out of all the Smoothies above which one did you like the most? 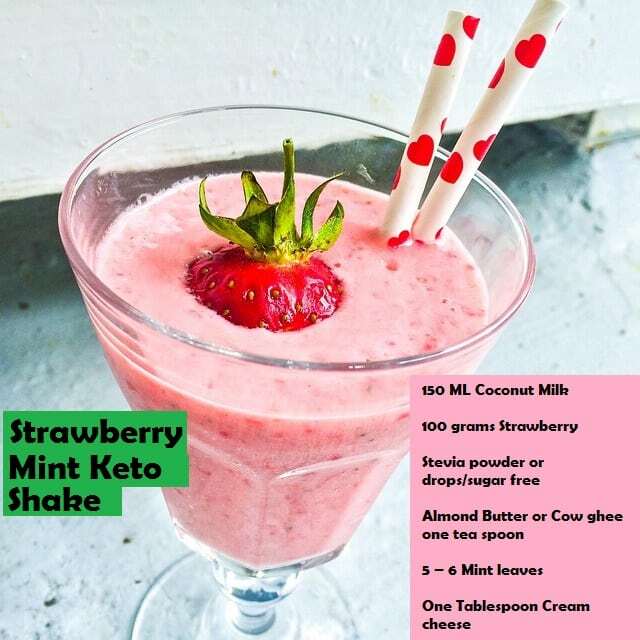 Do you have a keto shake recipe of your own? Feel free to comment on the comment box below. can we use cream instead of cream cheese, as given in the ingredients and also can we use some other milk in substitute of almond milk? You can definitely use high fat milk if you are not lactose intolerant, but almond milk works best.